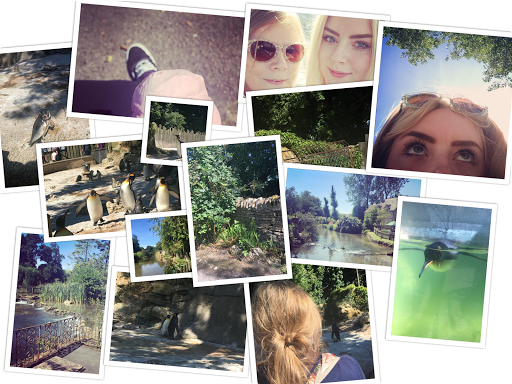 Roughly a week ago my mama and I travelled to The Cotswolds to visit Birdland Park and Gardens in Bourton-On-The-Water. The village itself is between Oxford, Gloucester and Cirencester, however we stayed in a hotel in Cheltenham and travelled to the village as we know Gloucestershire well from many years of holidays there during my teenage years. My mama has a slightly bizarre obsession with penguins, therefore for her birthday we wanted to do something she would enjoy and so Birdland was an obvious choice to combine two ideas; fun and animals. Possibly the strangest thing about Birdland is that there is no glass like is in London Zoo; you can practically touch the Penguins, and indeed many of the other animals. For example, chickens just seem to roam free around the park. Its surroundings are incredibly rural, next to a river canal and even inside the park itself there are many wide growths and almost forest-like areas, allowing the birds to feel more at home in a natural habitat. We watched the Penguins being feed alongside a speech from one of the keepers. He explained and answered questions about how the Penguins deal with such hot weather and also more in depth about the different kinds of Penguins they have. It's fascinating to watch the animal being fed, as the most enjoyable part of the feeding process is the talks given to audience alongside the feeding. You can watch flamingos and Pelicans being fed, as well as the Penguins. However the largest crowd was at the penguin feeding. 'Meet a Keeper' is another interesting activity to do whilst you're there,many the fact that all of these activities are free is pretty incredible, especially considering the low cost of the ticket price to enter the park. During the meet a keeper session you can ask questions and even hold some animals, such as the tortoises; children seemed to love getting to be close to the animals.